Bri Thomas for Fashionably Austin wrote a great recap blog post about the Bernina Fashion Fund Showcase and Shusi's win. Read the full blog post here. BERNINA has been a sponsor of the Fashion Fund for several seasons and in past years a winning designer was announced during a night of the runway shows. This year an entire night of 19 up-and-coming designers were featured sending a five-look collection and who all have brands that are three years old or less. And the BERNINA Fashion Fund Judge’s winner was…SHUSI! Kaitlin Blaylock for Black Texas Magazine wrote an article detailing the events during Austin Fashion Week and highlighted that Shusi was a competitor to watch during the Bernina Fashion Fund Showcase. Read the full article here. "For the first time, designers will compete live for the prize, with judges Amy Sherfinski, Director of Marketing BERNINA of America, Camille Styles, camillestyles.com Gail Chovan, Fashion Designer, Lance Avery Morgan, Publisher of The Society Diaries, Gunnar Deatherage, Fashion Designer, Korto Momolu, Fashion Designer, and Kaki Gaines, Luxury Manager of The RealReal. Korto will also be presenting a collection, alongside Samantha Plasencia and Adrienne Yunger. Competitors to watch include Shavanthe, Shusi, and Alexandra Lee Designs." 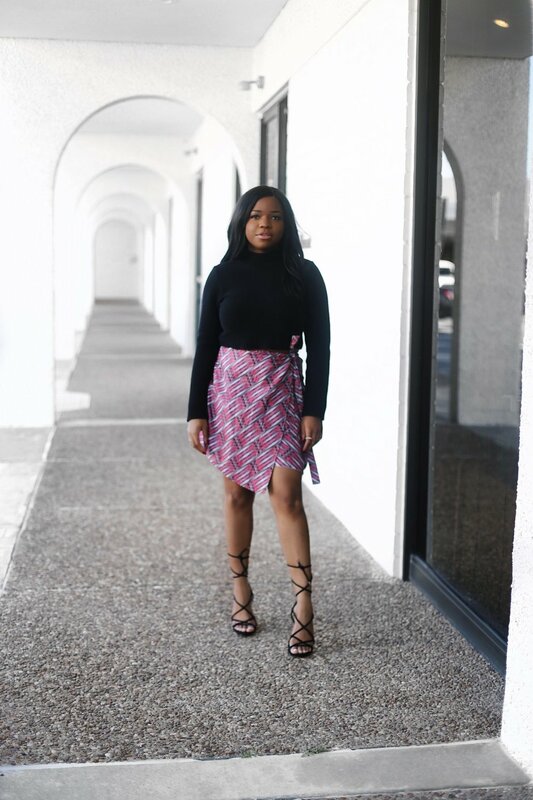 Shusi's creator, Toyosi, recently sat down with Daily Texan Reporter, Katie Balevic, to share her thoughts on how she hopes to dispel the ignorance towards the African continent by highlighting the beauty and culture of Africa through fashion. Instead of working in oil and gas, chemical engineering graduate Toyosi Shusi is debuting her own fashion line exclusively using fabrics imported from Africa. “I’m striving to make it more accessible to use these African prints to express yourself in everyday life,” Shusi said. Shusi, who has always had an interest in fashion, said it wasn’t until college that she realized how she could combine sewing with her Nigerian heritage. Shusi said her family members in Nigeria ship her the fabrics that she uses to make her clothes. In the future, Shusi said she hopes to have all of her production take place in Nigeria. “I want to start an atelier, which is like a fashion workshop in Nigeria, so that my clothes will actually be made in Nigeria by local Nigerians,” Shusi said. To Shusi’s close friends, her dedication to making clothes exemplifies her passion. Ogbonnaya said Shusi initially didn’t realize people would pay for her designs, and when she did, she undercharged. Shusi’s professors say her work has always stood out. “I’ve had students that were very influenced by their heritage, but Toyosi is the first one that has really embraced African fabrics,” said Gail Chovan, a textiles and apparel lecturer. Exposure to new cultures is critical to learning about different groups of people, Shusi said. Shusi said anyone can wear African prints as long as they are knowledgeable about their meaning. Shusi was featured in a Huffington Post article this holiday season in support of immigrant businesses. Check out the article here to see Shusi's feature as well as the other 9 shops that were featured. From Madison Ermenio's Blog "Tiny Triumphs"
“Toyosi, what are you doing honey?” her mom called out to her. 8-year-old Toyosi Shusi sits cross-legged on the living room floor, her mouth wide open and the white glow of the TV reflecting on her tiny face. She’s mesmerized as the models strut down the runway, sporting the designer’s newly created outfits. At that moment, she was hooked. Toyosi fell in love with fashion. She watched Project Runway with her family, and she admired Raven’s character on That’s So Raven. She loved that they were putting all of themselves into their very own unique creation. Since that time she has been dreaming of fashion, but she never pursued it. As a college student, she has largely focused on her studies – Chemical Engineering – and extracurriculars. Like so many of us, her bucket list item – learning to sew – sat on the back burner. She decided she was going to change that in the summer of 2015. She took out the sewing machine that had been collecting dust in her closet for six months, and she wasted no time. She got right to teaching herself – she watched YouTube videos constantly and dedicated herself to the art of creating clothing. When she first began to learn, the clothing she made was basic, and it took her painstakingly long amounts of time to finish the articles. Nevertheless, when she was finished with an item, she couldn’t ignore the feeling it gave her – fulfillment and a sense of confidence. Over the past two years, she has developed her skills greatly, even to the point of making outfits for not only herself but her friends. Her favorite memory was when she made matching outfits for her entire acapella group, Voices of Africa. They were competing in UT’s annual talent show called Texas Revue, and Toyosi wanted them to go all out. She used an African fabric called kente cloth that is traditionally worn by Ghanaian royalty, and she transformed it into something completely their own. They were entirely invested in every aspect of the competition – both in their performance and in their appearance. On the night of the show, they won both the best act overall and the crowd favorite. Toyosi said that now, creating clothing is a creative outlet for her and a form of self-care. She is currently in the process of starting her own clothing line, Shusi, so she can share her designs with others.